Next is a commissioned painting for Joshua Pauley. Here's my sketch. Starting to paint the ground. I broke my palette knife today. I guess that means I was working hard or something. The Fray, How to Save a Life. 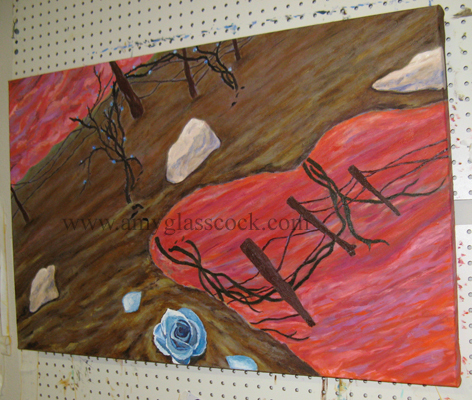 I started to add the rose vines. 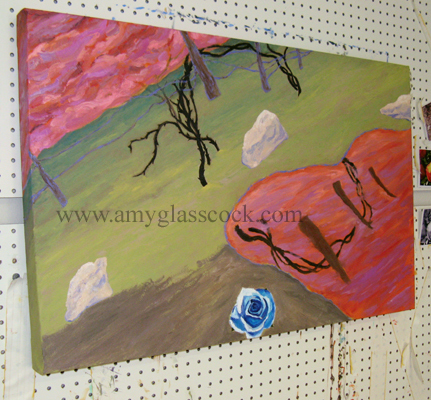 I worked on the rose a lot today. I like it better now. 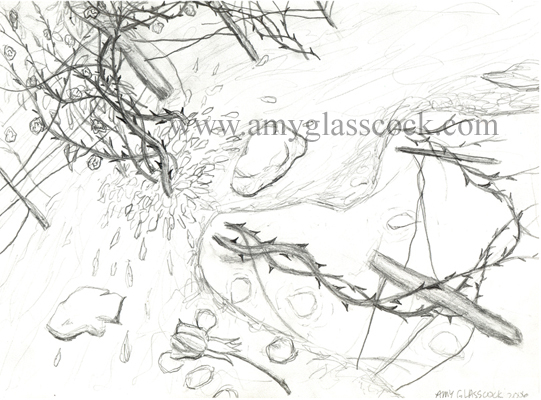 I also made the fence post reflections longer and added a little to the vine. Musical Inspiration of the Day: Benji & Courtney Wedding Favor Mix CD. ICE DAY!!! I had lots of time to paint today because I didn't have to go to work. Today I tried to figure out where I want the reflections to be. 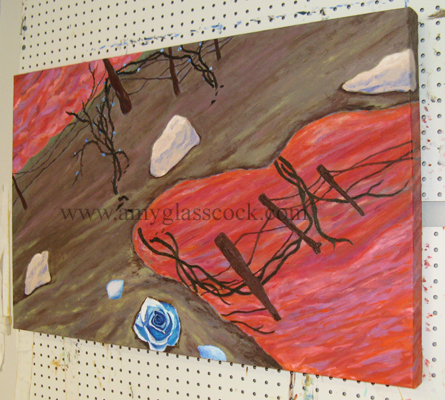 I moved the fence posts out further and added part of the vine. 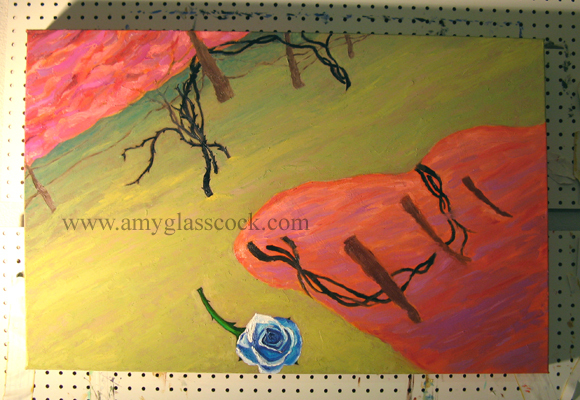 I also changed the shape of the water some as well as added the stem to the rose. And obviously I changed the sky color. I will probably change the color of the ground too. Musical Inspiration of the Day: Tifah, "Safe and Sound" CD. 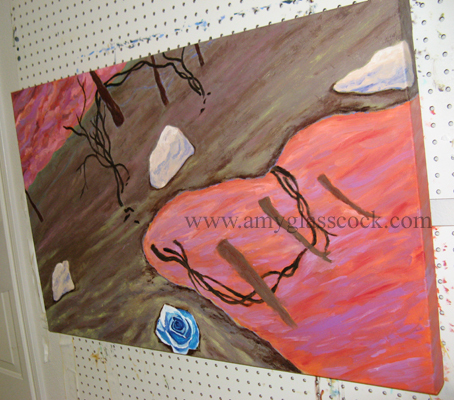 I added the rocks and some purpley blue shadows on the fence. I also decided to get rid of the rose stem. 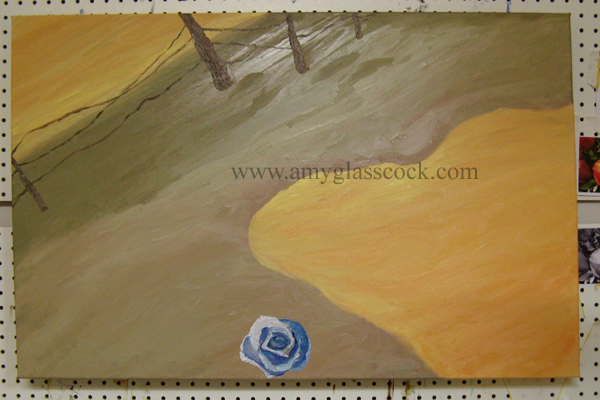 I am still working on the ground color amongst other things. 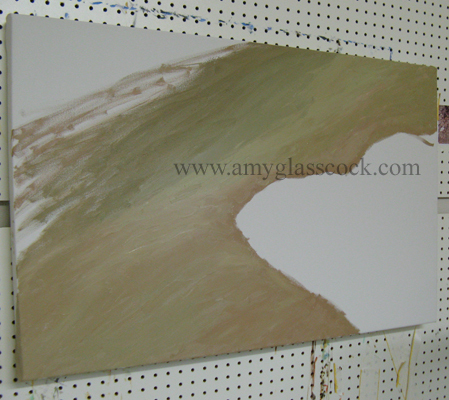 I worked on the ground color more today. 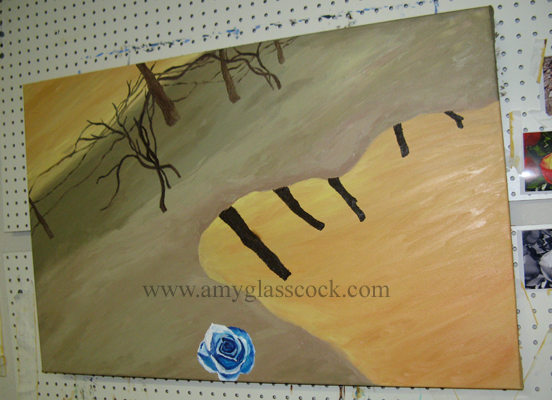 I think that the foreground is coming together, but the background still needs work. Musical Inspiration of the Day: Mix 96.5 Radio, The Fray, How to Save a Life CD. I am still working on the ground color. 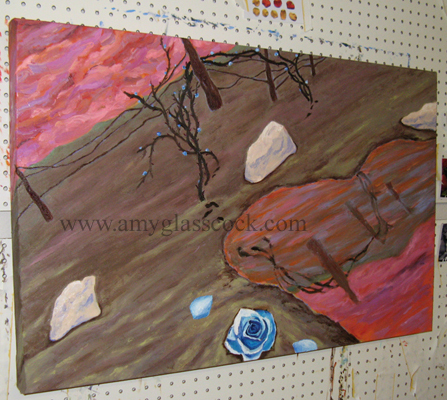 I added some more contrast to the foreground and shadows under the rocks. I also brought the vines and fence posts back to life. 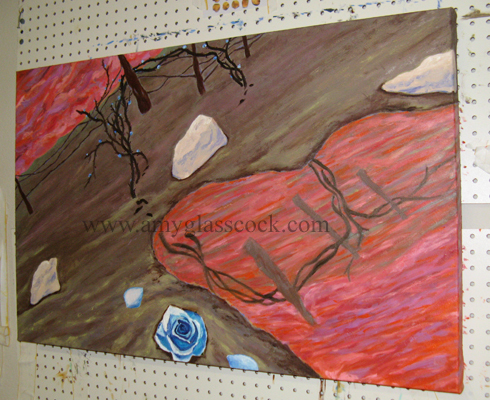 I worked on the rose vine a lot today. 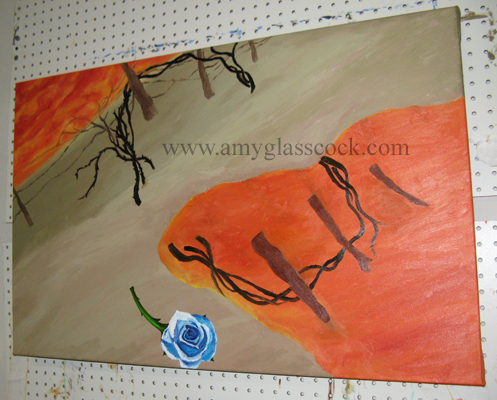 I added reddish thorns and blue roses. 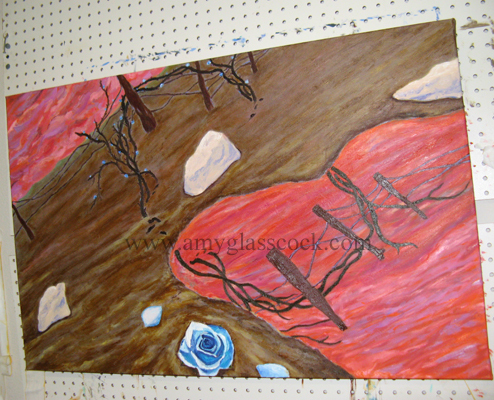 I also began adding rose pedals to the foreground. I also added brown to the wire on the fence. Musical Inspiration of the Day: David Crowder, Illuminate CD. Inspiration of the Day: Romans. NIV Audio Bible. It's starting to come together! 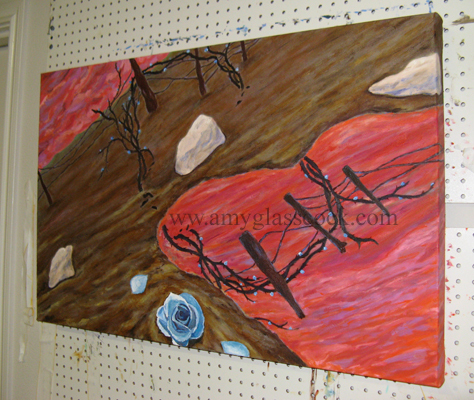 I still have to change the color on the fence wire and add the thorns and roses to the reflection. I also need to work on the rose petals more. But I'm almost done. Musical Inspiration of the Day: Benji & Courtney Wedding Favor Mix CD & Mix 96.5 radio. Musical Inspiration of the Day: Norah Jones, Feels Like Home CD. Mix 96.5 radio. 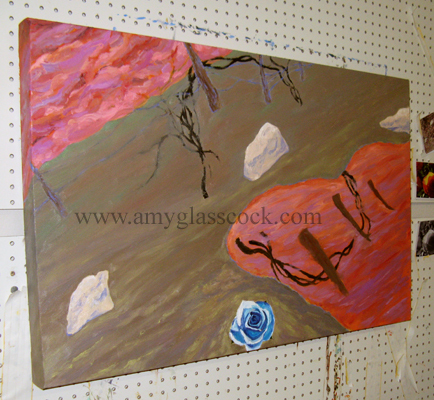 I worked on the rose today. 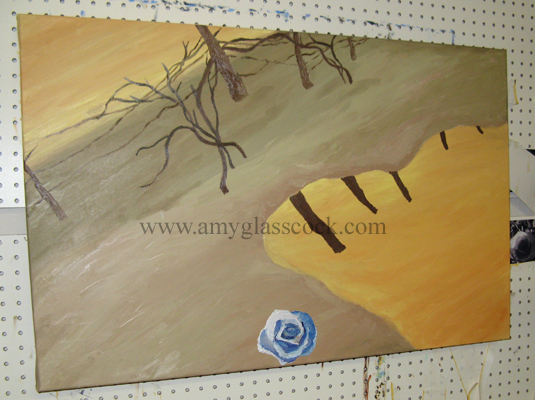 I also added some contrast to the foreground with dark brown. Also I added a splash of brown to the rocks to make them blend in a bit better. Musical Inspiration of the Day: Randy Travis, Glory Train CD. 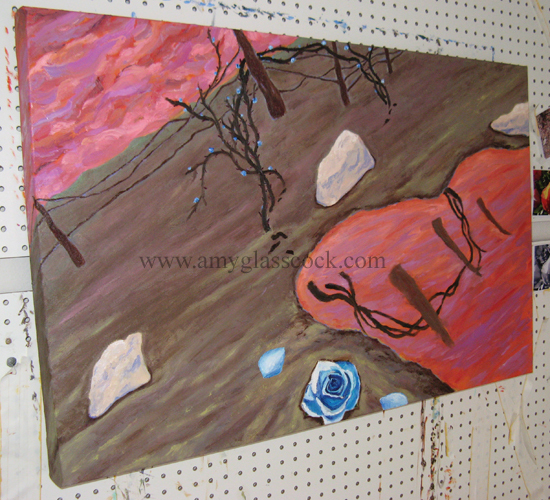 I added the roses and worked on the fence more today. Musical Inspiration of the Day: The Fray, How to Save a Life CD.